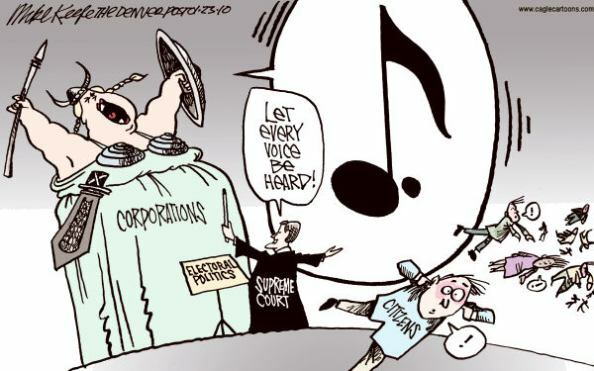 Last week, the Supreme Court handed down a decision in the McCutcheon v. Federal Election Commission case which struck a blow against democracy and moved the United States one step closer to plutocracy. This decision invalidated aggregate campaign donation limits, increasing the amount of money each millionaire/billionaire can give to the politicians of their choice. If nothing is done to mitigate the influence of money in politics (ex. a Constitutional Amendment banning money in politics), the consequences of this ruling will only serve to jam open the floodgates for big money to keep inundating our political environment and corrupting our elected representatives. This corruption is toxic to every political ideology—from conservatives who hate corporate welfare to progressives who want to protect the environment—and, until we manage to fix it, most debates in Washington will be decided based upon who has the most money and power. The McCutcheon v. FEC case decided whether it is constitutional to limit individual and aggregate donations to individual candidates and party committees. Shaun McCutcheon, the right wing donor who brought the case, argued that aggregate and individual donation limits infringe upon his 1st Amendment right to “speak” during elections (under Buckley v. Valeo political donations equal speech) while the FEC argued that donation limits were necessary to fight corruption. Unfortunately, in a move that surprised nobody, the conservative majority of the Supreme Court agreed with the argument that political “speech” via campaign donation should be more “free” (if you can afford it), thus they struck down the aggregate campaign limit. This was a 5-4 decision along partisan lines, where Justice Thomas concurred with the other conservatives but wrote an opinion stating that ALL contribution limits should be struck (thus advocating the view that US campaign finance regulations should be sent back to the 1800s). 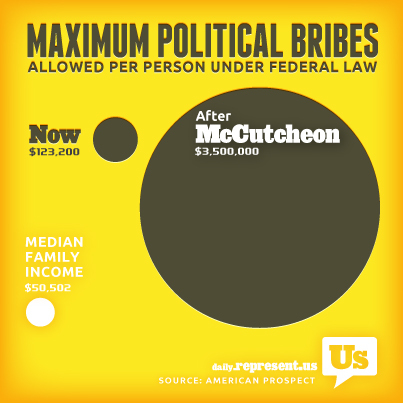 Before McCutcheon was decided, any American who could afford it was allowed to donate up to $2,600 to Congressional and presidential candidates and $32,400 to any party committee; in total, these donations were constrained by an upper aggregate limit of $123,200 for any one individual DONOR per election cycle. The post-McCutcheon campaign finance regulations still restrict individual campaign donations to $2,600 per candidate and $32,400 per party committee, but there is no aggregate cap that would prevent donors from giving the maximum donation to any and every politician and committee. This dramatically increases the amount of money that each super-donor could contribute to any one party as a whole and creates the problem where candidate committees can raise large sums of money and redistribute it in a way that violates the spirit of individual contribution limits (doubling up donations to at-risk districts by donating to safe politicians and having them transfer the funds). If a conservative billionaire wants to donate $2,600 to every Republican candidate during every election cycle (in the House alone, this could include as many as 435 maximum donations every two years), while giving the maximum donation to the RNC, then that is now their right. Similarly, it would be perfectly fine for an oil company CEO to donate to EVERY member of the House and Senate, as well as both the RNC and DNC—this would give them a hook in every Washington politician that could be used to dissuade action on addressing climate change or cutting subsidies. With this quote, Roberts and the four conservatives who signed onto his opinion, prove that they are either too stupid to serve on any court, never mind the Supreme Court, or are complicit in allowing the wealthy to corrupt our democracy—I don’t know which is more frightening, but I would argue that it is the latter which is true. In effect, this quote says that it is corrupt when a politician rents his vote to a moneyed interest on a specific issue, but it is simply fine for those same interests to wholly buy a politician during an election so that they don’t need to explicitly pay them for every favor. Under this definition of corruption, corruption only occurs on the small scale and the fact that moneyed interests give millions of dollars to politicians during election times doesn’t even give the appearance of corruption. By limiting the definition of corruption to such a specific and overt exchange, the Supreme Court promotes a climate of extreme and widespread corruption, where moneyed interests avoid accusations of corruption by expanding their corrupt actions to a scale so large that it doesn’t fit the definition. Rather than pay a politician to support a specific bill, moneyed interests can just buy politicians outright with lump-sums during elections and control every vote that they make in office—as these interests pay the bribe up front, there is no overt quid pro quo for each corrupt action that the politician makes while in office. It would take an incredibly dense person not to recognize this inherent flaw to the Supreme Court’s definition of corruption. 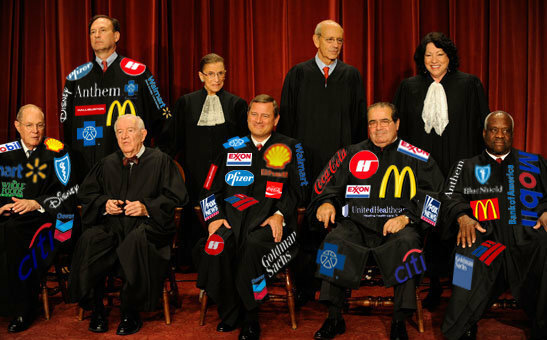 While I do not subscribe to the notion that conservative justices like Scalia and Thomas are great legal minds, I do give them enough credit to assume that they can recognize how flawed their definition of corruption is and the likely consequences of their action; as such, the only logical conclusion is that the conservative majority on the Supreme Court is now acting as a type of plutocratic fifth column within our government. 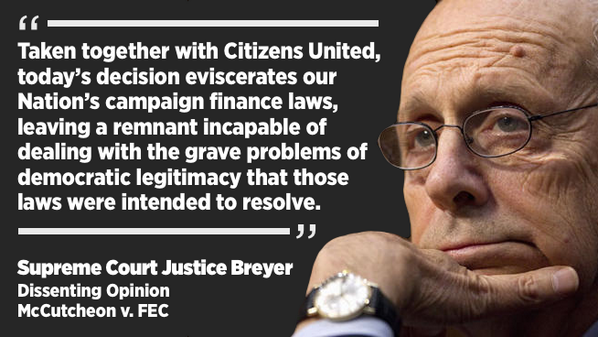 Put simply, the combination of McCutcheon and Citizens United pretty much obliterates the effectiveness of any current campaign finance regulations—Citizens United legalized unregulated and unlimited corporate dark money donations while McCutcheon deregulates individual direct donations. Campaign finance deregulation has already led to immense corruption in favor of moneyed interests and there is no reason to assume that this corruption will not continue to spread after the McCutcheon decision begins to allow even more money into politics. The only beneficiaries of eliminating the aggregate caps on donations are people who want to spend more than $123,200 every two years on politics (according to FiveThirtyEight, this includes only 600 donors); as most Americans don’t have that kind of money to spare, this decision will only enhance the “speech” of the very wealthy in the political sphere. When the wealthy are given more access into and control over politics, their policy preferences are given preference over those of the poor and middle classes. Studies have shown that Congress already gives the preferences of the wealthy massively disproportionate weight in their policy choices, and McCutcheon will only worsen this disparity. In short, our democracy is devolving into a plutocracy where the government is controlled by a select group of wealthy and powerful private interests. Currently, we are a fair distance down this path, but there is still a ways to go before it becomes absolute. 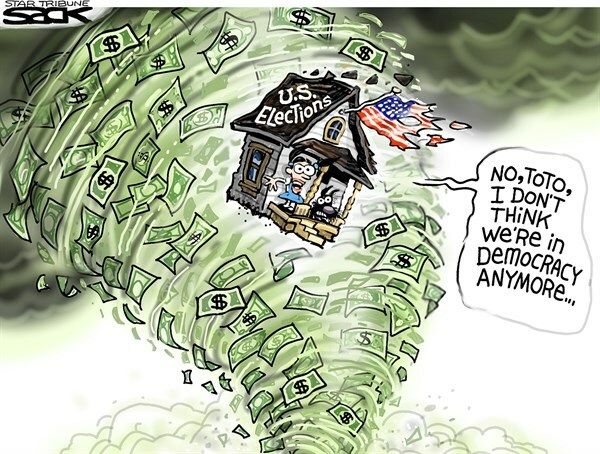 If we do nothing and keep letting our democracy decay, we will still get to vote and wave the flag every few years, but those elections will only allow us to choose which corporate puppet is allowed to screw us over in favor of their donors—politics will be a rigged game, where the American public has the illusion of choice and the wealthy have the certainty of victory. Simply said, money is property not democratic speech, else those with less money have less speech. The cartoon of the opera singer says two things: those with the money will drown out other voices, and of course, “it’s all over when the fat lady sings”. Reblogged on the New NY 23rd, and my personal page. Thank you.